There is something about the way that Nomad Factory does analog that is unique and great-sounding. It probably has to do with the way the products were conceived. Rather than mimic or emulate a certain piece of gear or circuit down to the last detail, Nomad Factory goes after the ‘soul’ of analog sound. That is probably why their plug-ins have a way of transforming a sound into something ‘special’ and why the Nomad Factory plug-ins have stayed popular through the years. But don’t take our word for it, try demoing any one of them and see if you agree. If you do like them, then we have made it very easy to pick one or two of them up. The very best of the Nomad Factory Analog Series are on promo at over 60% off until the end of March. 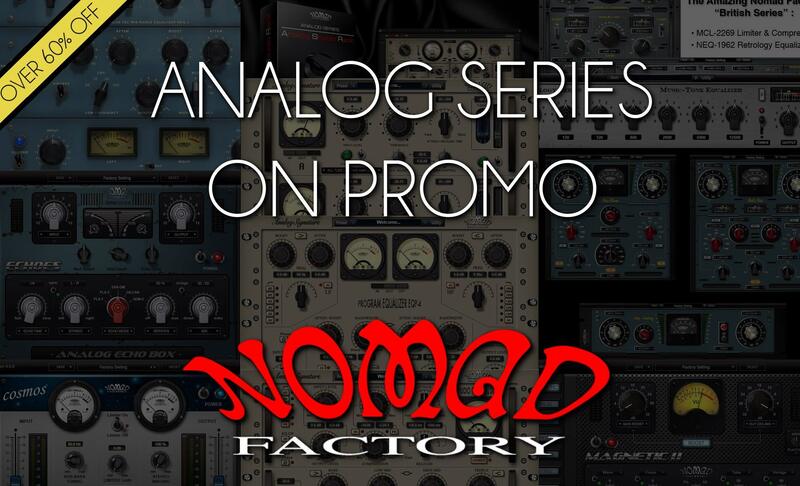 Nomad Factory’s “Best of Analog Promo” is available right now at the DontCrack Store. This entry was posted in Audio Software, DontCrack, Plug-ins, Promotions and tagged Analog Mastering Tools, Analog Signature Pack, Analog Studio Rack, ASP Limiting Amplifier LM-662, ASP Program Equalizer EQP-4, ASP Studio Channel SC-226, British Bundle, Cosmos, Magnetic Bundle II, Magnetic II, Motown Retro Bundle, Nomad Factory, Pulse-Tec EQs. Bookmark the permalink.